“Sir, you are now the President of the United States.” ABC has released the first trailer for their upcoming new series Designated Survivor. 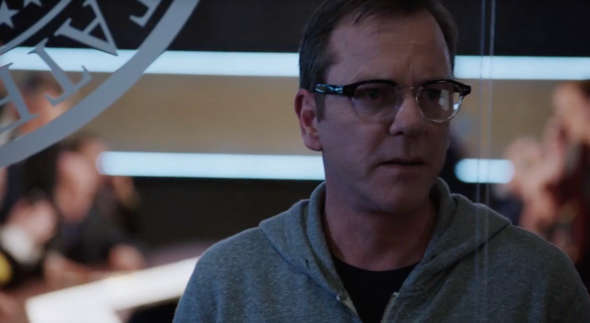 The drama stars Kiefer Sutherland as “Tom Kirkman, a lower cabinet member who unexpectedly becomes president after a devastating attack on Washington.” Natascha McElhon, Maggie Q, Kal Penn, Adan Canto, Italia Ricci, LaMonica Garrett and Tanner Buchanan also star. Yes, I like it. Interesting scenario. Also like the actors. Hoping it continues! Designated Survivor should be canceled “NOW”. There is already too much violence on TV and the world. This will only give “NUTS and TERRORIST” ideas. If Kiefer is there, Im there!!! I am a fan of Kiefer Sutherland. I will be watching. I’m upset that it’s replacing NASHVILLE ~ it’s gonna have to be spectacular to garner my attention. I will give it a chance but I’m praying another network picks up the best show ABC ever aired NASHVILLE. I ‘am a fan of Kiefer Sutherland I will be watching. Looks good. I will be watching, but I am not in the 17-39 group, so I guess I don’t count. When are the networks going to realize that that group is not the group who is watching TV. From Jack Bauer to POTUS. Great to see Kiefer Sutherland back on TV.